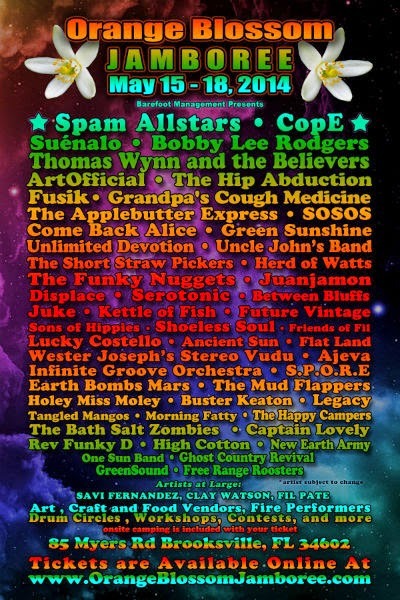 This weekend, Florida's finest homegrown festival, Orange Blossom Jamboree, will bring music and art to the Sertoma Youth Ranch in Brooksville, Fla. Over 50 live bands — including Spam Allstars, Cope, ArtOfficial, Come Back Alice, and more — will perform over four days, May 15-18. Beer will be available on site, with 100% of proceeds benefiting the Sertoma Youth Ranch. The ranch was established in 1974 by Tampa Bay area clubs of Sertoma International, which was founded in 1912 to assist people with hearing health issues and offer community education on the concerns of those with hearing disabilities. The Sertoma Youth Ranch's mission is to "provide a rustic outdoor recreational area for the children of Florida." Four-day passes are available here for $75. Two-day passes will be available at the gate for Saturday and Sunday ($60), as well as single day passes for Sunday only ($20). Kids 14 and under are free with a ticketed adult. Amenities include hot, private showers, car camping, and campfires in designated areas. Leashed dogs are also allowed at this event. Visit the Orange Blossom Jamboree website for more information, including schedules, workshops, and directions to the ranch. Also, find out how you can compete in this year's Coolest Campsite Contest. Subscribe to Live Music Is Evolving's weekly update or like it on Facebook for information on other live music events happening in Florida.